The two Wisconsin billboards by People for the Ethical Treatment of Animals (PETA) that parodied the dairy industry's popular "Got Milk?" campaign have been taken down. 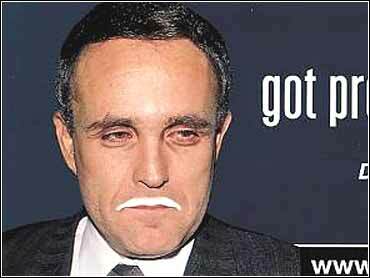 The ads depicted New York Mayor Rudy Giuliani wearing a milk mustache and asking: "Got prostate cancer?" The ad claims a connection between drinking milk and prostate cancer, for which the mayor is being treated. PETA spokesman Bruce Friedrich said the animal rights group received a fax on Friday afternoon saying the company that put up the ads would take them down, because PETA had not received Giuliani's permission to use his likeness in the campaign. "It seems that in addition to being linked to obesity, heart disease, cancer, stroke and osteoporosis, in Wisconsin dairy products also destroy your backbone," Friedrich said. French Advertising in Fond du Lac put up the billboards Wednesday in Appleton and Oshkosh, Wis.; a third had been planned in Fond du Lac, Wis. Friedrich said a Giuliani billboard was still up outside of Lancaster, Pa. It's PETA's latest attack on the dairy industry, succeeding in angering not only Wisconsin farming leaders, but Giuliani as well. Wisconsin farm leaders attacked the ads as misleading and insensitive. "I think the advertising company has risen above the ridiculous by pulling the ads," said Tom Thieding, spokesman for the Wisconsin Farm Bureau Federation. The billboards, he said, amounted to "exploiting an individual who's got health problems that aren't linked to dairy consumption." "We know that consumers are more savvy than to fall for that kind of exploitation," Thieding said. The billboards invite people to visit the Web site Milksucks.com, which claims that studies point to an increased risk of prostate cancer in men who consume dairy products. According to PETA's Web site, studies show that men who consumed at least 2.5 servings of dairy foods daily were 30 percent more likely to develop prostate cancer than men who consumed half a serving a day. But Giuliani disagrees. "Milk is healthy and milk has absolutely nothing to do with why I have prostate cancer," he said. The New York City mayor said he was considering suing PETA because the organization was using his image in an advertisement without his permission. "It's tasteless and inappropriate to exploit my illness and also takes advantage of my position as the mayor for advertising purposes," said Giuliani. "The message they're trying to deliver just makes sense in their own zealous, out-of-control thinking." A study by the Harvard School of Public Health n April raised the possibility that consuming lots of milk and other dairy products could modestly increase the risk of prostate cancer. The study stressed that the question was far from settled and recommended further study of calcium's effects on health. PETA targeted Wisconsin for the ad because it's "America's Dairyland, so it seems to be the perfect place to bring the message that dairy products are horrible for human health, catastrophic for the environment and a living nightmare for these cows and their veal calf babies," said Friedrich, the group's vegetarian campaign coordinator. The milk industry pointed out that other research suggests dairy products help fight high blood pressure, colon cancer and osteoporosis. "True to form, it's their typical insensitive way of misleading the public for their own gain," said Debra Wendorf Boyke, spokeswoman for the Wisconsin Milk Marketing Board. The animal rights group has pulled previous ads that incited controversy. A PETA ad campaign that urged college students to drink beer instead of milk was pulled last spring because of objections by Mothers Against Drunk Driving (MADD).